Sorry it's been so long since since my last post. I've had company in town for the past few weeks so I've been entertaining. Anyway, during this past weekend I found out of one of my best friends is getting married! I was the last one to get hitched so now my shining moment is over and it's time for me to take the position as supporting, beaming bridesmaid! 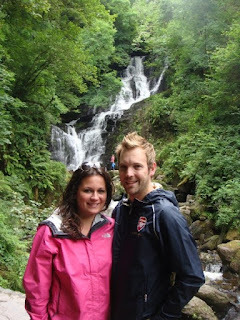 Here is a picture of the lovebirds who got engaged in IRELAND! Talk about jealous! But no, I'm so happy for her. She's having the time of her life with the love of her life doing things I've only dreamed of. I remember the excitement of getting proposed to. It was such an amazing weekend. I remember it like it was yesterday. And to think that it will be our one year anniversary next week is crazy. Time really flies by, but more on that in a later post! I'm just so happy for Heather and Mark!